There are many reasons why it has taken me some time to write on this blog. There is a new posting on the way, but in the meantime, an important event needs announcing for all of those who don’t follow the Forbidden Music Facebook page. Vienna has finally established a centre for recovering and studying Europe’s musical legacy destroyed after 1933. It’s called the “exil.arte Center”. In 2006 Professor Gerold Gruber, founded “exil.arte” at Vienna’s University of Music and Performing Arts. 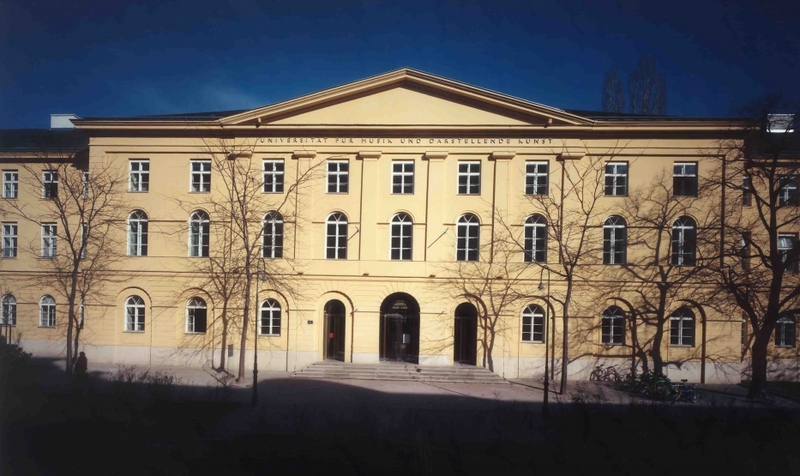 (In German: Universität für Musik und Darstellende Kunst Wien, or MDW for short) With the closure of Orpheus Trust, which was established in 1996, exil.arte became the only organisation in Austria involved in the recovery of the physical and cultural legacy of musicians and music lost during the Nazi years. Professor Gruber invited me to co-chair while I was still working as Music Curator at Vienna’s Jewish Museum. As anyone who has read Forbidden Music – the Jewish Composers Banned by the Nazis will have noticed, the most prominent Jewish composers were, with only a few notable exceptions, Austro-Hungarians. Of course Kurt Weill and Walter Braunfels weren’t insignificant : But against these names, along with Berthold Goldschmidt, Manfred Gurlitt, Günter Raphael or Paul Dessau, one had to place a line of composers starting with Karl Goldmark and carrying on through Gustav Mahler, Arnold Schoenberg, Alexander Zemlinsky, Franz Schreker, Erich Wolfgang Korngold, Hanns Eisler, Hans Gál, Max Brand, Egon Wellesz, Ernst Toch and countless others. There were cultural as well as political and social reasons why specifically Jewish musicians gravitated towards Vienna in preference to Berlin, Munich, Hamburg or Frankfurt. It made the post-war demand for cultural restitution all the more urgent in Austria and it was a source of endless frustration to see the country’s home-grown musical legacy recovered by neighbouring Germany, or distant America, France and Great Britain. Austrian cultural managers would shrug their shoulders and tell me I shouldn’t blame Hitler for everything. After all, they would explain, “If Bartok, as an exile composer had managed to get a hearing post-war, these other forgotten names were in all likelihood not worth fussing about.” This was the reason I could find no Austrian partners when planning the series “Entartete Musik” which I produced for London/Decca. What became progressively more distressing over time, was the arrogant repetition of this view, even as it was being disproved by concerts and events taking place abroad. Non-Austrian friends and colleagues explained it was due to lingering anti-Semitism while others put it down to an attempt to evade guilt. Myself, I concluded it was a sense of self-satisfaction in holding ignorant convictions. To be fair, how could little Austria take responsibility for all the composers and musicians, born as “subjects” of the Habsburg Empire pre-1918? The fact that all of the nations to emerge from Habsburg rule, such as Czechoslovakia, Poland, the Ukraine, Romania or Yugoslavia would also leave these composers unclaimed meant their legacy sank to the bottom of history’s “Lost-and-Found” box. During the inter-war years many chose to remain Austrian citizens despite living and working in Berlin, Zagreb, Budapest, Prague or Krakow. Once Hitler’s policies disowned them, they had no country to which they could owe allegiance, and no country that would stake a claim to them as musicians. The young Polish born Composer Viktor Ullmann, murdered in Auschwitz, yet remained an Austrian citizen after 1918 despite living in Prague. His place of birth, Teschen (today known as Český Těšín) was originally Austrian, changing to Czechoslovakia then ultimately Poland. Yet Vienna’s musical legacy is enormous regardless of how one places it within the context of 20th century history. One fact remains uncontested: from Gluck, Haydn, Mozart and Beethoven to Brahms and Mahler, the city attracted genius. By the start of the 20th century, it no longer needed to import talent as it was producing its own. The nomenclature of brilliance, knowledge and natural ability stood in marked contrast to the actual size of the city. To be a stylish keyboard player with an un-showy technique was only a small part of being a Viennese musician. Over the years, the stories of the city’s musical exiles teaching in distant lands and demonstrating on the piano the entire canon by memory became the stuff of legend. These were men and women who could transpose at sight and accompany by memory while enthusing students with an understanding of formal and harmonic structures while explaining composers within their historic/cultural context. To have this legacy deliberately annihilated was a crime, yet to recognise that the very city that produced such brilliance would also be the instrument of its own destruction offers a morality tale that called for resolution. Vienna is still a city that unlike any other has a public that remains unmatched in its appreciation of municipal opera companies, orchestras, chamber ensembles, diverse conservatories and its two (!) performing arts’ universities. It maintains some of the world’s most beautiful concert halls, with the sheer wonder of its golden Musikverein eclipsing the beauty of the Konzerthaus or the virtually forgotten Ehrbarsaal. Music is the city’s deepest life-giving artery with thousands of ordinary citizens supporting its institutions and ensembles in the manner that other cities support football clubs. Hitler destroyed Vienna’s musical inheritance, but he could not destroy the city’s crazy passion for music. In Summer or Spring with windows open, the sound of instruments being practiced is all-pervasive. If ever there was a city pre-destined to recover Europe’s lost musical legacy post- 1933, it was Vienna. Now, after decades of denial and resistance, recovery has become a true possibility with MDW’s new chancellor, Ulrike Sych, inviting Prof. Gruber and me to take our organisation exil.arte and turn it into a research centre, operating from the very building where Vienna’s lost generation studied. The nature and sheer scale of loss is such that exil.arte recognises that it can no longer focus on just Austria’s cultural loss. For starters, nobody seems to be able to agree what “Austria” is – or was. The destruction Vienna unleashed on Europe with its home-grown Nazi progeny demands that the scope of research is international and covers all of Nazi dominated Europe. The exil.arte Center will not only provide every service offered by normal archives or libraries, but become a true partner to scholarship and understanding. This means it must be more than just a “dumping ground” for a lost, and difficult to recover past. Its primary purpose will be to become a launching pad for the future. In practical terms this means taking the study of a musical estate and digitising and making available as much as legally possible, while filling in missing bits that may be housed in different archives. If, for example, letters are addressed TO a composer or musician, exil.arte tries to find the other side of the exchange. It will connect manuscripts in other archives for which it has sketches, or sketches for works which are housed with exil.arte as manuscripts. By being located within a performing arts university with more than 4000 students, it has the opportunity of exposing young musicians to works they can explore as researchers in addition to performing as musicians. I think this may be a first for any performing arts Institution. What wonderful news. I hope the initiative proves successful beyond everyone’s fondest hopes. Yes, quite a milestone. Congratulations Michael and best wishes for great success. You’ve done more than probably anyone else to get Vienna to recover its musical past,meaning here the first half of the 20th century. Keep us posted of developments. All goosebumps with excitement about this announcement. Bravissimo, Michael!! Incredible news! Thanks for letting us know, Michael. Oh wow fantastic, Michael, congratulations, WHAT an accomplishment!! Joseph Beer DEFINITELY needs to be there!!! Oh wow fantastic, dear Michael, congratulations, WHAT an accomplishment!! Joseph Beer DEFINITELY needs to be there!! !